Alfred Thomas married Frances Emily Parsonage, daughter of Thomas Parsonage and Frances Elizabeth Blake, before 1890. 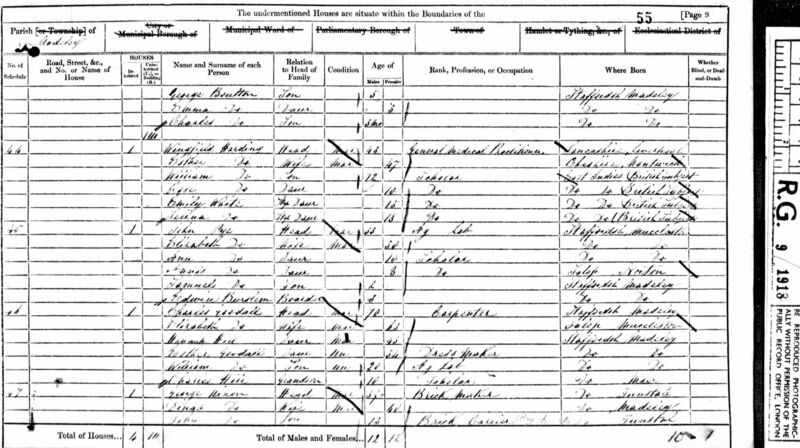 Alfred Thomas appeared on the 1891 Census in, Crewe, Cheshire, , and Frances Emily Parsonage and Daisy Blake Thomas were living in the same household; Alfred was a butcher. Alfred Thomas appeared on the 1911 Census in, Crewe, Cheshire, , and Daisy Blake Thomas and Frances Emily Parsonage were living in the same household; Alfred was a butcher. Daisy Blake Thomas was born in 1890. 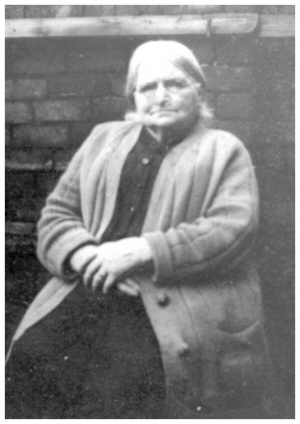 She appeared on the 1891 Census in, Crewe, Cheshire, , and Alfred Thomas and Frances Emily Parsonage were living in the same household; Alfred was a butcher. Daisy Blake Thomas appeared on the 1911 Census in, Crewe, Cheshire, , and Alfred Thomas and Frances Emily Parsonage were living in the same household; Alfred was a butcher. Her married name was Hardman. Elizabeth Hesketh married John Hardman, son of John Hardman and Margaret Sixsmith, in 1858. 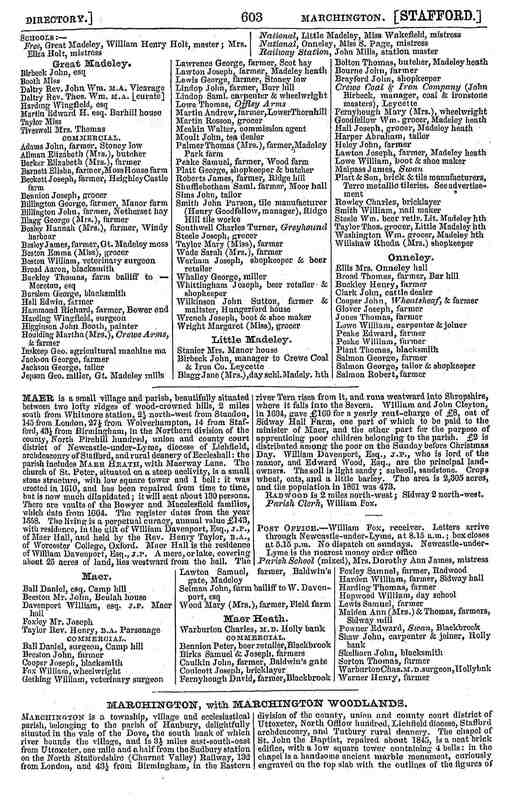 Elizabeth Hesketh appeared on the 1871 Census in, St Helens, Lancashire, , and John Hardman, Joseph Hardman, John Hardman and William Hardman were living in the same household; John Senior is described as a General Labourer, as are all of his sons. Also present is Margaret Hesketh a niece and scholar aged 8 years. Joseph Hardman was born circa 1850 at, Prescot, Lancashire, . 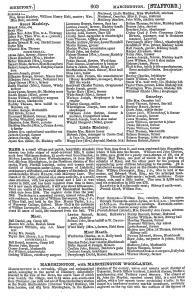 He appeared on the 1871 Census in, St Helens, Lancashire, , and John Hardman, Elizabeth Hesketh, John Hardman and William Hardman were living in the same household; John Senior is described as a General Labourer, as are all of his sons. Also present is Margaret Hesketh a niece and scholar aged 8 years. John Hardman was born circa 1853 at, St Helens, Lancashire, . 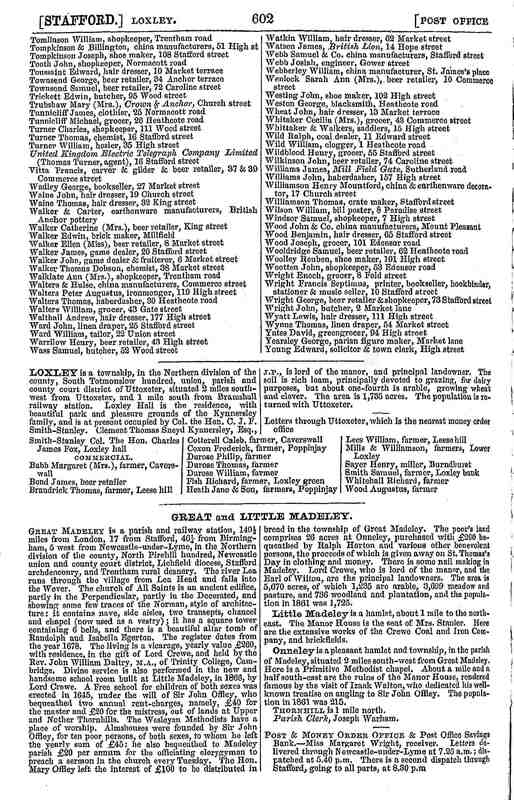 He appeared on the 1871 Census in, St Helens, Lancashire, , and John Hardman, Elizabeth Hesketh, Joseph Hardman and William Hardman were living in the same household; John Senior is described as a General Labourer, as are all of his sons. Also present is Margaret Hesketh a niece and scholar aged 8 years. William Hardman was born circa 1855 at, St Helens, Lancashire, . 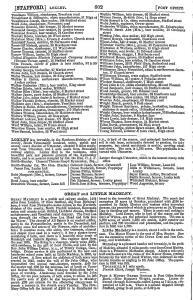 He appeared on the 1871 Census in, St Helens, Lancashire, , and John Hardman, Elizabeth Hesketh, Joseph Hardman and John Hardman were living in the same household; John Senior is described as a General Labourer, as are all of his sons. Also present is Margaret Hesketh a niece and scholar aged 8 years. James Garner was born in 1869. He married Ann Farrar. Her married name was Garner. Ann Farrar was born in 1869. She married James Garner. George Garner was born in 1892. He died on 24 April 1918; The Commonwealth War Graves Commission Website records that George Garner, aged 26 years, a Rifleman of "A" Coy. 1st/5th Bn., SOth Lancashire Regiment was the son of James and Anne Garner, of 80, Talbot St., St. Helens, Lancs. His death is commemorated at the Conde-sur-l'Escaut Communal Cemetery. This cemetary contains the graves of 90 Commonwealth servicemen of the First World War, all of whom died in German hands between June 1917 and October 1918. The cemetery also contains three French war graves. Louis Garner was born in 1900. He died in 1906. Wingfield Harding was born before May 1816 at, Liverpool, Lancashire, . He married Esther (?). Wingfield Harding appeared on the 1861 Census in, Staffordshire, , and Esther (? ), William Harding, Rose Harding, Selina White and Emily White were living in the same household; Wingfield, the head was described as a General Medical Practitioner and Emily and Selina were his step daughters. On 7 April 1861 Wingfield Harding General Medical Practitioner. He appeared on the 1871 Census in, Staffordshire, , and Rose Harding and Esther (?) were living in the same household; Wingfield was described as an Asst Surgeon, Rose was described as a school mistress. Wingfield Harding died on 2 May 1878 at, Manchester, Lancashire, . Her married name was White. Her married name was Harding. Esther (?) was born circa 1814 at, Nantwich, Cheshire, . She married William White; In the April-June 1843 musters (WO12/1213) - Private White was "On Furlo' 22 April to 30th June 1843", (that's to say, he was on leave). This was presumably in India and the cryptic entry suggests that this might have been when he married Esther, though the regimental rolls are no help with this whatsoever. His leave period (and his marriage?) might also have had something to do with him being put on permanent detachment to Madras almost as soon as the leave ended, rather than staying with the regiment in Bangalore. Esther (?) married Wingfield Harding. Esther (?) 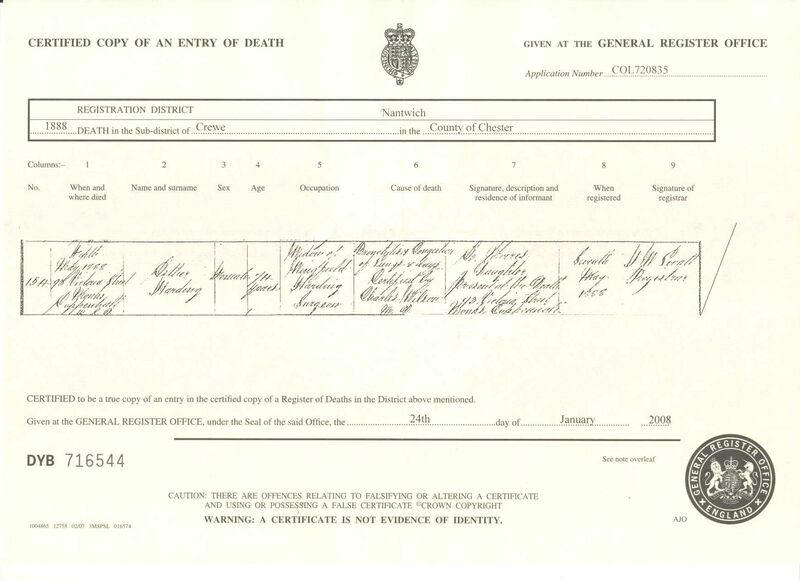 appeared on the 1861 Census in, Staffordshire, , and Wingfield Harding, William Harding, Rose Harding, Selina White and Emily White were living in the same household; Wingfield, the head was described as a General Medical Practitioner and Emily and Selina were his step daughters. Esther (?) appeared on the 1871 Census in, Staffordshire, , and Wingfield Harding and Rose Harding were living in the same household; Wingfield was described as an Asst Surgeon, Rose was described as a school mistress. Esther (?) appeared on the 1881 Census in, Manchester, Lancashire, ; Esther is described as a widow and a boarder, her daughter Selina was living a few streets away in Boundary Road in 1871. Esther (?) died on 5 May 1888 at, Crewe, Cheshire, . Marriage* She married William White; In the April-June 1843 musters (WO12/1213) - Private White was "On Furlo' 22 April to 30th June 1843", (that's to say, he was on leave). This was presumably in India and the cryptic entry suggests that this might have been when he married Esther, though the regimental rolls are no help with this whatsoever. His leave period (and his marriage?) might also have had something to do with him being put on permanent detachment to Madras almost as soon as the leave ended, rather than staying with the regiment in Bangalore. Marriage* Esther (?) married Wingfield Harding. William Harding was born circa 1849 at, , East Indies. He appeared on the 1861 Census in, Staffordshire, , and Wingfield Harding, Esther (? ), Rose Harding, Selina White and Emily White were living in the same household; Wingfield, the head was described as a General Medical Practitioner and Emily and Selina were his step daughters. Rose Harding was born on 29 June 1851 at, , East Indies. She was christened on 29 July 1851 at, Madras, Tamil Nadu, , India. She appeared on the 1861 Census in, Staffordshire, , and Wingfield Harding, Esther (? ), William Harding, Selina White and Emily White were living in the same household; Wingfield, the head was described as a General Medical Practitioner and Emily and Selina were his step daughters. 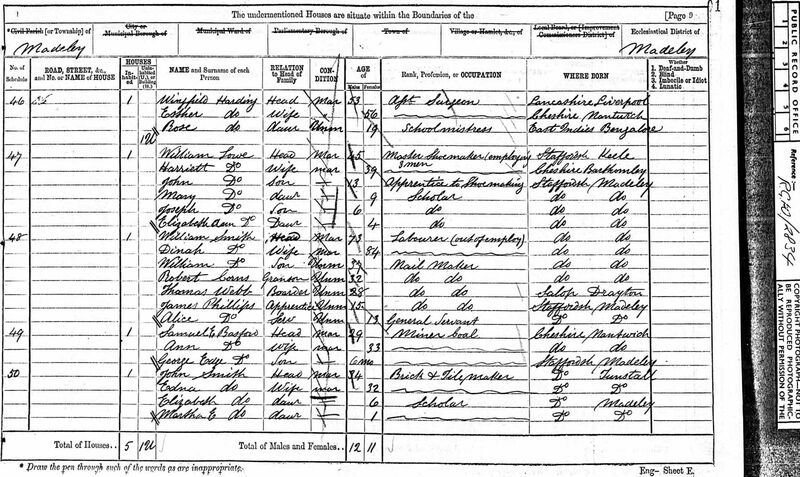 Rose Harding appeared on the 1871 Census in, Staffordshire, , and Wingfield Harding and Esther (?) were living in the same household; Wingfield was described as an Asst Surgeon, Rose was described as a school mistress. Selina White was born on 24 March 1847 at, Tamil Nadu, , India. She was christened on 20 April 1847 at, Madras, Tamil Nadu, , India. She appeared on the 1861 Census in, Staffordshire, , and Wingfield Harding, Esther (? ), William Harding, Rose Harding and Emily White were living in the same household; Wingfield, the head was described as a General Medical Practitioner and Emily and Selina were his step daughters. Selina White appeared on the 1871 Census in, Manchester, Lancashire, ; Selina was described as a boarder, no occupation given. 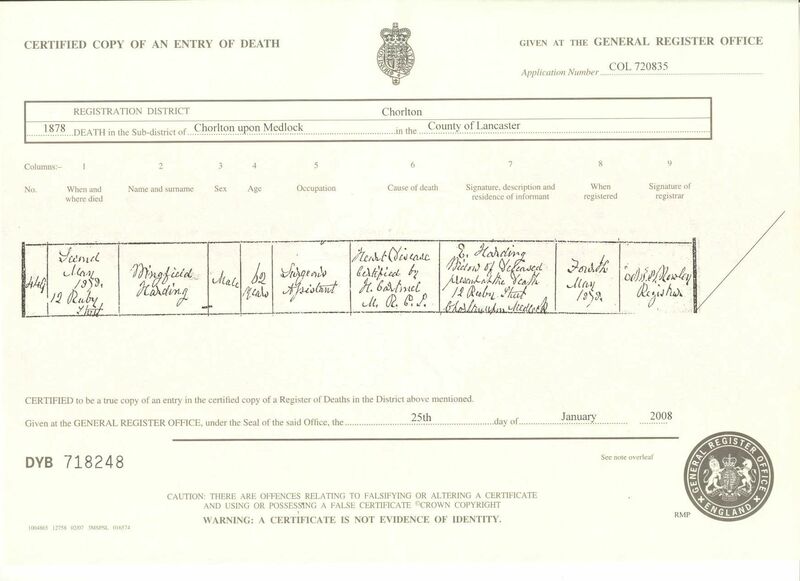 As of 25 September 1876,her married name was Hookham. Selina White married William Hookham on 25 September 1876 at, Cheshire, ; Selina's address at marriage was given as 26 Alton Street, Monks Coppenhall, which was the home of her sister Emily in the 1881 census. Selina White appeared on the 1881 Census in, Manchester, Lancashire, ; Selina was described as a widower and was living with three other people who were boarders, Thomas Kingeley (42yrs), Reuben and Fanny Hannah (both 9yrs). 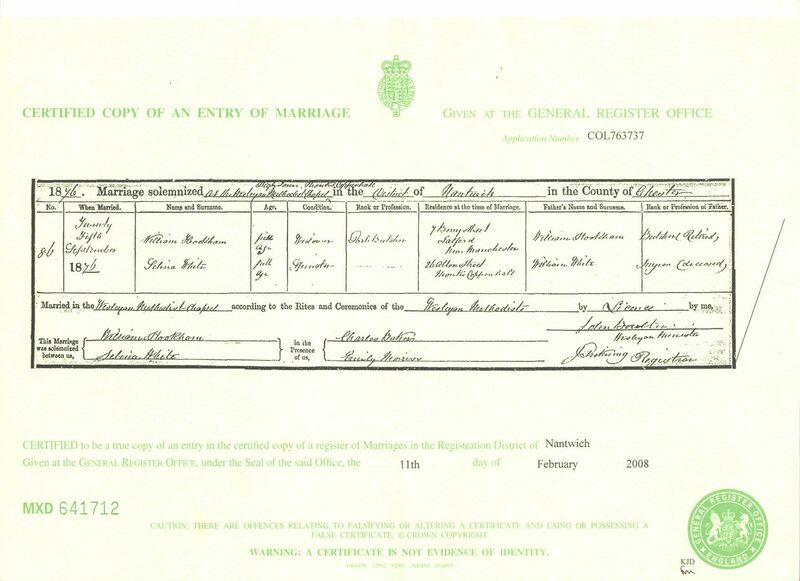 Marriage* Selina White married William Hookham on 25 September 1876 at, Cheshire, ; Selina's address at marriage was given as 26 Alton Street, Monks Coppenhall, which was the home of her sister Emily in the 1881 census. 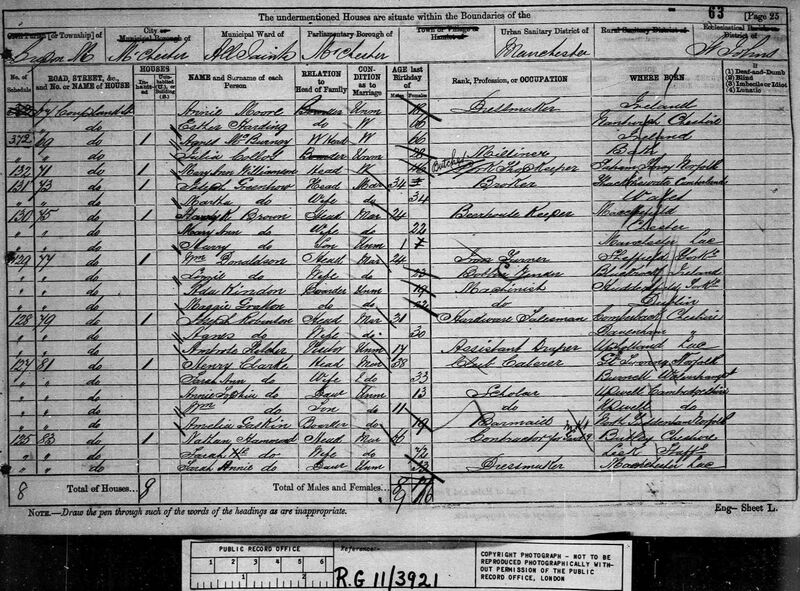 1911 Census was census Frederick and Hannah were visitors at the home of Hannah Maria Schofield, a Boarding House Keeper. Frederick was described as a Grocer not in business, and out of work. Frederick and Hannah were recorded as having had no children. on 2 April 1911 at, Blackpool, Lancashire, . 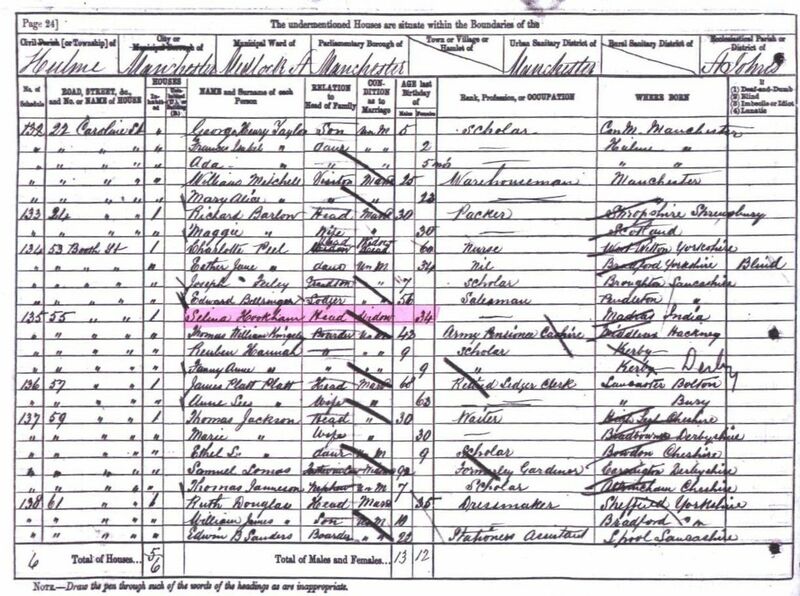 1911 Census was census Eliza was a farmer and her three children were working on the farm. They had a visitor Caroline Penlington aged 74 and a servant Mary Lawson. on 2 April 1911 at, Cheshire, . 1911 Census was census George was the Borough Surveyor of Crewe and his son John was the Assistant Surveyor. Elizabeth Reeves a servant lived with teh family. on 2 April 1911 at, Crewe, Cheshire, . 1911 Census was census Alfred was a butcher. on 2 April 1911 at, Crewe, Cheshire, . 1911 Census was born on 2 April 1911. 1911 Census was census Alexander and his brother Fred were both described as Grocers Assistants at the Cooperative Stores. Mary Alexander's mother is described as a widow. on 2 April 1911 at, Crewe, Cheshire, . 1911 Census was census Herbert was described as a Gas Maker at the Lead Smelting Company, and there were two lodgers James Taylor and John Ashton. The census record shows that there were 10 children that had been born alive and just four of them living at the time. There were 8 persons in the house sharing four rooms which included any kitchen. on 2 April 1911 at, St Helens, Lancashire, . 1911 Census was census William was a boilermaker in the mines and earned $1248 in the year working a 60 hour week for 40c per hour. Jennie, William's sister was staying with them at the time, and a lodger was William Cashmore who Jennie later married. on 1 June 1911 at, Sudbury, Ontario, , Canada. Alexander B. Parsonage was born circa 1905 at, Crewe, Cheshire, . He appeared on the 1911 Census in, Crewe, Cheshire, , and Alexander Beck Parsonage, Fred Waldensian Parsonage and Mary A. Beck were living in the same household; Alexander and his brother Fred were both described as Grocers Assistants at the Cooperative Stores. Mary Alexander's mother is described as a widow. William Hookham was born circa 1838. He married Selina White, daughter of William White and Esther (? ), on 25 September 1876 at, Cheshire, ; Selina's address at marriage was given as 26 Alton Street, Monks Coppenhall, which was the home of her sister Emily in the 1881 census.